Today I have Peach Papaya from China Glaze's 2011 Island Escape collection. If you like orange polish, I recommend Peach Papaya. It's an in your face, beautiful, bright creme that reaches full opaqueness in 2 coats. 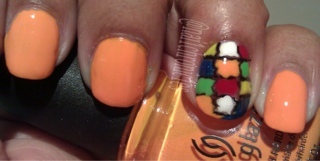 I attempted a puzzle design on my accent nail. With a little more practice I think I may actually dig the puzzled look. Pics with the flash represent the Peach Papaya's truest color.